Social-networking site MySpace plans to launch its eagerly anticipated music store later this month, in a bid to rival the two big players in digital music: Apple's iTunes and Amazon's MP3 store. The site, dubbed MySpace Music by its creators, will allow users to buy songs and albums, stream videos and listen to full length tracks over the internet. The site will also sell artist merchandise, gig tickets and mobile phone ringtones. Three of the four big players in the record industry are on board with the project: labels Universal, Sony BMG and Warner, though a deal has yet to be struck with EMI. The store is not meant to be merely a carbon copy of what is already out there, and there are some significant differences between the MySpace and iTunes offerings. On MySpace Music, users will be able to listen to entire tracks, while iTunes only allows users to listen to snippets of songs through the Apple Store before purchase. 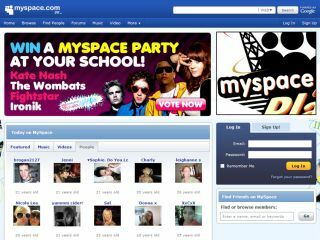 More significantly, MySpace will allow fans to share music with one another through their profile pages as well as build their own individual playlists. MySpace's co-founder Tom Anderson was keen to assert the site's individuality: "It's not the same kind of listening you do with iTunes, it's about sharing songs with your friends and checking out what they are listening to." Given the mass of unsigned bands on MySpace, MusicRadar is interested to see what (if any) avenues the company offers for independent artists to get their music onto the store.